Are you ready for the “season of rush”? Do you ever feel like work and life have become a blur? Do you wonder where the days go? How will you get your stuff done? Will you survive another year, month, week or day of this ‘crazy busy’ life? 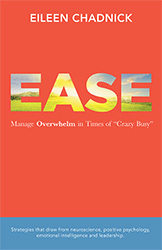 Ease offers strategies to manage overwhelm in times of “crazy busy”. Eileen Chadnick, ACPC, PCC, is passionate about inspiring positivity and well-being. A certified coach, and principal of Big Cheese Coaching since 2003, She works with leaders (of all levels) — fostering mindsets, behaviours and strategies for success and fulfillment. – Linda J. 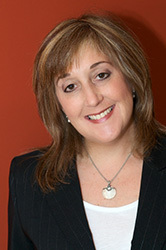 Page, PhD, President of Adler International and Co-Author of Coaching With the Brain in Mind. The Globe and Mail interviews Eileen about Ease: Read the article here. News Release: Ease - Offers 'ease-y' strategies for complex times. Available from most online retailers - see here! Join the conversation! Sign up for Eileen's newsletter. What’s Your Intention (Word or Theme) for 2018? Here’s Mine….